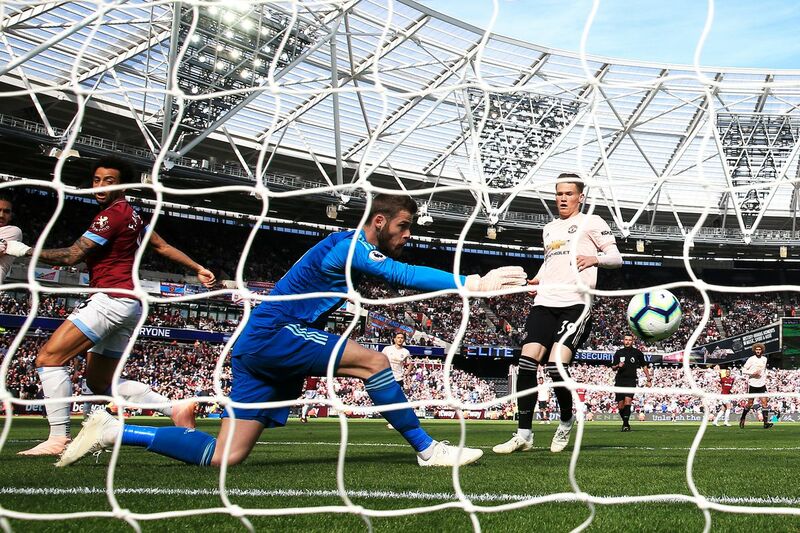 Coming off the back of four losses in five games and another Champions League loss at Old Trafford, United look to get back on track against a wobbling West Ham this Saturday. Ole Gunnar Solskjær will face-off against a former title winner in Manuel Pellegrini, who truly settled in at the London Stadium with a resounding victory in the reverse fixture. The ever-unpredictable Premier League continues for these teams who have each had turbulent terms. In what proved to be one of José Mourinho’s more damning defeats, an early nonchalant backheel from Felipe Anderson – who is now stuttering in front of goal – a deflected Andriy Yarmolenko drive which and Marko Arnautović’s strike on the break meant a magnificent Marcus Rashford goal was rendered worthless. The Hammers exploited the Red Devils with sharp counter attacks, piercing the porous defence multiple times. Lukasz Fabiański played his part, stopping United hitting the back of the net when the game was still in the balance. West Ham’s back line dominated as the partnership of Issa Diop and Fabián Balbuena – who made 10 clearances – frustrated Romelu Lukaku on numerous occasions. Mark Noble ran the show in the middle of the park with 11 ball recoveries to compliment an 86% pass success rate, earning an assist for the third goal. Scott McTominay was deployed at centre back and his then-boss labeled him as ‘special’ and someone that the team ‘needed’ at the time despite losing Felipe Anderson for the opener. A dip in form has cost West Ham their place in the top half of the table, with two wins and four losses in their last six league outings. Barring from some Eden Hazard brilliance, the Hammers can count themselves unlucky to not have taken any points from Stamford Bridge, creating chances and putting in a more than decent shift. Manuel Lanzini returned from a lengthy injury around six weeks ago but has failed to register a goal contribution so far. Marco Arnautović dramatically denied a January move to China but has come under fire for his recent less than impressive performances. Focusing on a player who has impressed, 20-year-old holding midfielder Declan Rice has been subject to speculation about a summer transfer to United after recently breaking into the England set-up. Star man Felipe Anderson is having a stellar maiden season at West Ham, scoring eight goals and grabbing four assists while averaging 1.8 key passes per game but the Brazilian has only scored once in 2019. United were defeated by Barcelona on Tuesday via an own goal but are still well in the tie despite not registering a shot on target on Wednesday. McTominay was widely regarded as the best player on the pitch for the slightly underwhelming occasion, producing a midfield display which any Red Devils man would be proud of to defy his critics. Coincidentally, in midweek, Mourinho used the term “Mad Dog” to describe the Scotland international’s display against FC Barcelona. Chris Smalling certainly dealt with Lionel Messi, giving the Argentine a bloody nose early on which quietened the down the five-time Ballon d’Or, winner. United also launched their ‘#allredallequal’ campaign on Friday, playing their part in the fight against discrimination. Ashley Young lost possession 30 times in the quarter-final and will miss out due to his red card at Wolverhampton Wanderers last week. Luke Shaw has picked up 10 Premier League yellow cards so is banned for two domestic games, as well as the second leg in Catalonia on Tuesday due to an accumulation of bookings in Europe. Therefore, with Matteo Darmian and Antonio Valencia unlikely to feature, Diogo Dalot and Marcos Rojo look set to start on the right and left respectively. Solskjær also noted that Phil Jones can play at right back. In the embargoed section of the manager’s press conference, club captain Valencia was confirmed to be leaving in summer after 10 years of service. Solskjær mentioned that he had a few names in mind regarding the role following the Ecuadorean’s departure, stating that the club captain must be one of the ‘cultural architects’ within the club. However, three youngsters in Ethan Laird, Lee O’Connor and Brandon Williams – who was included in the squad which travelled to Paris last month – could all stake a claim at full back ahead of the next first team campaign. McTominay’s masterclass will likely keep him in the team alongside Fred – who put in another decent shift. Nemanja Matić was not fit enough to feature and is unlikely to be included in the squad again due to illness. Alexis Sánchez has trained twice and is now “injury free” according to the Norweigan manager but will not be available until, at least, a return visit to the Camp Nou next week. Marcus Rashford was substituted in midweek, and could be rested if Anthony Martial is ready to return to the starting XI. Youngsters Mason Greenwood and Angel Gomes were spotted entering The Lowry hotel on Friday, with the pair surprisingly unlikely to feature in the U18 Manchester Derby this morning.